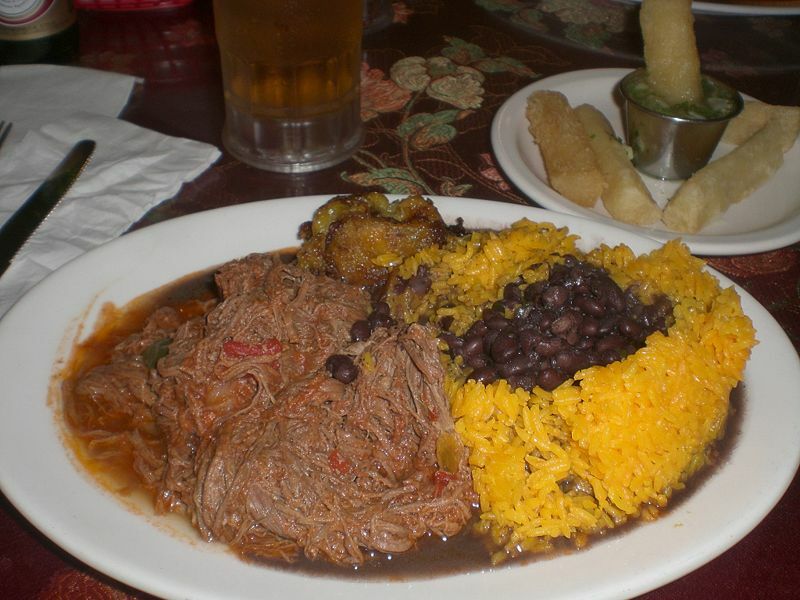 Ropa vieja, which is Spanish for "Old Clothes," is a popular dish of the Canary Islands, Greater Miami and the Caribbean, especially Cuba, Panama, Puerto Rico, and the Dominican Republic. It is a shredded flank steak in a tomato sauce base. Left: Authentic Cuban dish of ropa vieja (shredded flank steak in a tomato sauce base), black beans, yellow rice, plantains and fried yuca with beer. The origin of ropa vieja is from the Canary Islands (Spain), which were the last place ships from Spain would stop on the way to the Americas. They were also the first place that Spanish ships coming from the Americas would stop en route back to Spain. Due to this, Canarian culture is very similar to the Caribbean as well as Spain. The original version of Ropa Vieja contained leftovers, but later became a shredded meat dish with garbanzo beans and potatoes in the Canary Islands. Some versions in the Canary Islands contain beef or chicken or pork, or a combination of any of the three. The dish is a national feature of Cuba, and does not have garbanzo beans or potatoes in Cuba; it is just the shredded meat in sauce. There are many theories as to how the dish was named. One of the more popular ones is a story about a man whose family was coming to his home for dinner. Being very poor, the man could not buy them enough food when they came. To remedy his situation, he went to his closet, gathered some old clothes (ropa vieja in Spanish) and imbued them with his love. When he cooked the clothes, his love for his family turned them into a wonderful beef stew.